We're sticking around the county for one more night to play in the beautiful setting of Spring Bank Arts centre, a 19th century converted church, now used for an exciting array of arts programming. A quick hop across the county lines to seranade Lincolnshire. Our final stop takes us back to Lincolnshire for our last night of NRTF and Live and Local touring. We've been invited by one of London's finest live music establishments to paytribute to the life and music of Elliot Smith. The 6th of April marks the 50th anniversary of the legendary singer/songwriter's birth and we'll be making a choice selection of his music to interpret and perform. We're back on the road for The National Rural Touring Forum and Live and Local, this time paying a visit to Derbyshire and the picturesque church in Bradbourne; the perfect setting for some 3-part vocal harmony! We’re really excited to return for a second show at the Southbank Centre’s delightful Firday Tonic series. An open, public show in the shiny foyer of the Queen Elizabeth’s Hall to bring in the weekend in true London style. Looking forward to checking out a new spot in Hastings for our second gig of the weekend on the sea. We’re returning to one of our favourite live music spaces in the captial for a chilled, mid-week set. UPDATE: We are very sorry to announce that we are no longer able to perform at The Green Note on the 17th December. Don’t let this stop you getting your folk music fix because the magnificent Namlo trio are stepping in to bring you a night of beautiful Nepalese music. Our sincerest apologies to anyone who was looking forward to seeing us. We know Namlo will not disappoint so please do go if you can. We’ll be devising and performing the live musical score to accompany this special, all female edition. Book now, tickets are known to sell out! We're heading back in Lincolnshire for our final show of the tour before heading back home. Next stop: to seranade the good people of Worcestshire in their comfy and cosey Parish hall. Our first stop on our tour for with The National Rural Touring Forum and Live and Local. If you're lively and local, come down, have a listen, say hi. We're looking forward to being back on the warm and welcoming stage of the Jenny Lind Pub to play for the good people of Hastings. If you're in the area, come down and soak up some harmonies! We're heading up North to serrande the good people of Lincoldnshire with our harmony-fuelled folk-fables. A full day of music, workshops, singarounds and more. We're super excited to play at one of the folk's worlds most treasured resources and prized institutions! Other artists include Sam Kelly, Rachael McShane, Greg Russell and Ciaran Algar, Hannah James, Jack Rutter, Wör, Ange Hardy, Alice Jones, Anna MacDonald, London Klezmer, Kitty Macfarlane, Trials of Cato, Solasta....don't miss out! We're heading to Newbury, with our new additional cellist in residence to the aceist of spaces, for a full on night of folking great music. Friends in the West, come say hi! We've been invited to jet of to sunny Italy for an international street music festival in the beautiful town of Manciano. There'll be good weather, good food and good coffee. We can't wait. Our first festival of the season and our first and only UK gig with our 6-piece configuration. This intimate little festival is all about the grassroots: local food, local booze and local people getting together for a jolly good knees up. We're back at the home of our album launch and on one of London's hottest and freshest live music venues. We return to the legendary Green Note for a whole evening of our harmony-fuelled folk fables, hosted by Folk On Monday. Our first gig of the year will see us joined by a new member of the group: Maya McCourt will be filling in the low frequencies and weaving in some killer tenor lines on cello. We're off out of our native London to the first of a series of out of town gigs: hitting up the Burton Folk Club in Burton-On-Trent. 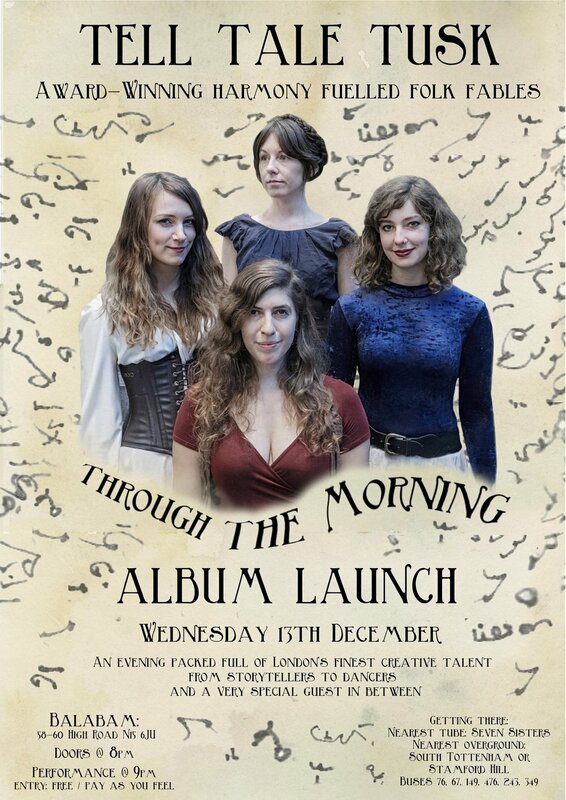 It is with great pleasure, we present to you our debut studio EP: Through The Morning. We want to celebrate the record with you in style so we'll be joined by some of London's finest, creative talent to bring you a night filled with virtuosic voice blending (thats us...) spellbinding storytelling, dazzling dancing and a few more surprises along the way. We're delighted to have been invited to play for the infamously intimate audiences of Tunedin.London. Promises to be a cosy affair so bring your listening shoes and your concentrating hats. We'll be sharing the stage in a collaborative venture with legendary vocal coach Marj McDaid (teacher and mentor to our own award-winning trio) for an afternoon of Irish song and poetry. Stoke Newington Old Church is the last surviving Elizabethan church in London and hosts some really special accoustics; don't miss out! The legendary Harrison Pub opens its doors for a 12-hour folk music marathon. Sharing the line-up will be some of the finest folksters from the near and far of the here and now. We're on at 6pm but be sure to get there early (3pm) for the amazing Nina Harries. We'll be telling our tales and singing our sagas to the good people of Hastings for one night and one night only in this historic old town. We return for the third time to play for the wonderful BreathArts, an important and inspiring charity that provides much needed light relief to the staff and patients of our brilliant NHS hospitals: this time round we'll be at St Thomas'. This year, our performance takes place as part of the Totally Thames festival; "an annual celebration of the River Thames with a creative and diverse programme that inspires, connects and enthrals"
We're back to one of London's favourite live music spots for a 6-piece show. We're returning to the very stage that we took to last year to compete and succeed in the first heat of the New Shoots Competion, this time to play a full set in the interesting accoustics of the Green Park Station. Similar to the work we do in London for Breathe Arts, we'll be playing for our heroic NHS staff and their charges, this time out West in the Royal United Hospital in Bath as part of their city-wide Folk Festival. Our final gig of the weekend: join us at The Thirty-Nine Steps Brewhouse for an evening of contemporary-folk music and house beverages from the venues' very own micro-brewery. Join us up close and personal for an unplugged set by the sea.